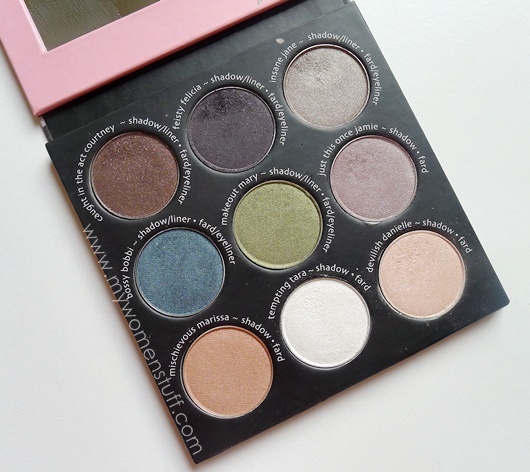 Now, Shady Lady Eyeshadow Palette Vol. 2! I think Shady Lady Vol. 3 is already out and Vol. 2 is getting hard to find, so this one is going to be kept short. I don’t usually like reviewing discontinued stuff, but I have to with this one because I much prefer the look of Vol. 2 to Vol. 3. The latter contains too many light shades while I think Vol. 2 is a more well rounded balanced palette. In terms of value, you get excellent value with the Shady Lady palette. Each eyeshadow is about the size of a MAC Eyeshadow and you get 9 in there so its pretty much a steal. I do find the colours a good mix of cool and warm shades although I’d say that they tend towards being very safe colours. The most exciting shades are the blue and green and that really, is about as exciting as it gets I’m not very good with colour descriptions so let’s let the swatches do the talking. 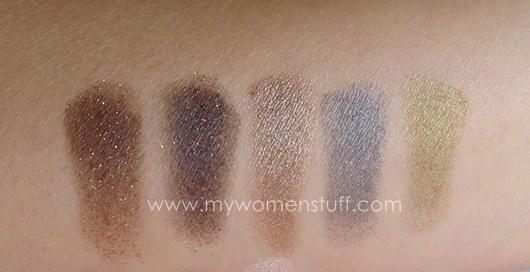 All these 5 shadows are darker and can be also used as liner or crease colours. 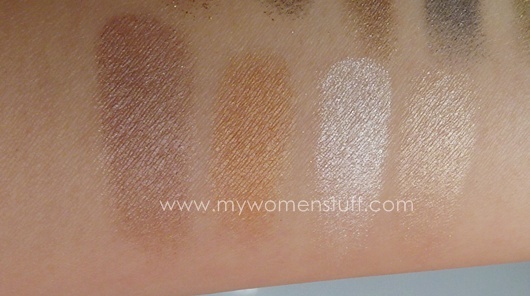 These 4 shades are more neutral shades and serve better as shadow colours or highlight. I find Mischievous Marissa and Caught in the Act Courtney too warm for me so I use them sparingly. the other colors are all very lovely. Each of the colours have been layered twice and you can see that they are very pigmented. They are also all metallic/shimmery in texture although I find Fiesty Felicia swatches a bit patchy and there is a little bit of fall out of glitter. I have no complaints about the rest which are wonderful and velvety in texture. I took this palette with me on holiday and it performed beautifully. You can use your fingers to apply or a brush and it works well enough both ways. There is a good mix of light and dark shades in here and on an overall basis, I’d say this is an excellent palette, both for everyday use and for travel. Lyn has a picture of Vol. 3 which as I have noted, I don’t quite like as much because the colours in there don’t suit me – purples and pinks? Erm… no thank you! – and I find it lighter overall. But if those are your sort of colours, do check them out. If the texture is similar, it would be a real steal. TheBalm Shady Lady Vol. 2 eyeshadow palette retails at US$39.50 or RM120 at Sasa stores locally. I got my palette from StrawberryNET.com where I noticed they still have some in stock. I will try to do an EOTD with Vol. 3 one of these days 🙂 I don’t mind pinks and purples but on my sisters, these colours make them look like they have bruised eyes. 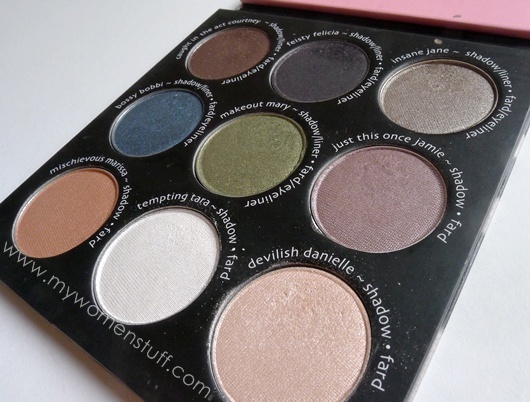 I agree the texture of these shadows are lovely, so smooth and soft but not powdery. Sasa HK (the actual shops) still have stock of both Vol. 2 and 3. If not mistaken, they were a wee bit more expensive per palette than Sasa MY. If anyone’s interested, run to Sasa in Subang Parade because there were a few palettes available the last time I checked (21st May). I noticed that you place a lot of orders at StrawberryNet. Are you aware of the numerous people that have shared their stories online about being heavily scammed but that website? Just wondering, because the products you bought seem to be fine!